RMS Titanic was a Royal Mail Steamer (or, Royal Mail Ship) whose maiden voyage was scheduled to take her to New York City in April of 1912. This "White Star Line" poster advertised the return leg of the ship's maiden voyage. Image online, courtesy U.S. National Archives. 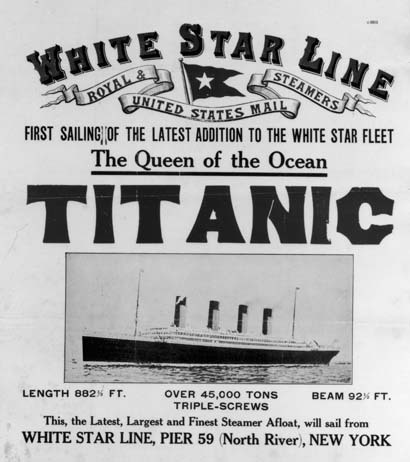 The White Star Line advertised heavily for Titanic’s maiden voyage. Departing Southampton on April 10, 1912, she was scheduled to leave New York City, to return home, on the 20th of April. From Southampton, Titanic’s first stop was Cherbourg, France. She picked up passengers (like Molly Brown) and then proceeded to Queenstown, Ireland where she arrived on the 11th. Known today as Cobh, Queenstown did not have a dock big enough for the massive ship. Frank Browne, 2nd officer David Blair and other passengers and goods were transported to/from shore on a tender, named "America." Launch tickets were used whenever people and baggage were ferried in this fashion. The price of a ticket for Titanic’s maiden voyage varied greatly depending on class. The range was $4,350 for first class (capacity 905) to $30 for steerage passage (capacity 1,134). Second-class accommodations (capacity 564) were $1,750. When the ship left Queenstown she had 2,200 souls aboard, including crew. Many passengers traveled with a great deal of luggage. They received baggage coupons and excess luggage tickets for each piece. The total amount of passenger luggage, however, paled when compared to the total provisions Titanic carried on her maiden voyage. From 8,000 cigars to 75,000 pounds of fresh meat - and "40 tons" of potatoes - no one would go hungry while the ship was at sea. First-class passengers would be hard-pressed to enjoy better dinners on land. As she weighed anchor for the last time, Titanic left Queenstown on April 11th. Follow the link to see Father Browne’s picture. Note, especially, the starboard panels that fatally struck the iceberg three days later. Bos, Carole "MAIDEN VOYAGE" AwesomeStories.com. Mar 01, 2004. Apr 23, 2019.